The commonly accepted belief that it never stops raining in Portland during the winter months is entirely true. It may not always be raining heavily, but the dark, grey clouds and the damp atmosphere are never far away, to the point that when September or October are drier than usual it only inspires Portland residents like myself to mutter about how it’ll take an extra month for spring to finally start. And worst of all, it’s not even an exciting kind of rain, no thunder or lightning and almost no wind, just an oppressive mood that encourages one to keep the wine supply ample and set an extra alarm in the morning. After that sketch however, the effects of the season are taken out save an occasional reference to sun lamps and winter diets, and what you’re left with is a fairly standard episode of Portlandia. Despite being presented as an ostensible holiday special and airing a few weeks before the show’s third-season première, “Winter In Portlandia” plays more like a reintroduction to the show’s universe, revisiting recurring motifs like cyclical hipsterdom, self-involved self-righteousness, and a loose relationship with reality. It’s a little disappointing, particularly after July’s “Brunch Special” toyed with the idea of a more narrative quasi-sitcom format for the show—but if reintroduction is its goal it does accomplish that. The episode is full of recurring favorite characters, and a couple of guest stars liven things up without being overwhelming. Most importantly, the sketches hit more than they miss. The episode’s runner centers on Peter and Nance, the former of whom is worried he’s putting on weight and decides that cutting pasta out of his diet is the best way to do so. Of course, being people who take their food seriously—this is the same couple who wound up in a cult trying to establish their chicken dinner’s pedigree—the excision of one food group flips the switch and turns Peter into an addict, a swift devolution Armisen plays wonderfully. By the second day he’s secretly looking at cooking websites and slamming the laptop shut when Nance enters. (She is of course horrified, which gives Brownstein her second best line of the episode: “This is demeaning. This is demeaning to pasta!”). By the third day he’s hidden bags of noodles in the toilet tank, and by the fourth he’s walking the streets in despair, munching on raw spaghetti and staring longingly through windows at people having dinner, eventually hitting rock-bottom with a carbohydrate binge in a cheap motel room. While this particular sketch loses steam once Robert leaves—the two refuse to look while changing the baby as a statement of gender blindness and wind up urine-soaked for their efforts—the introduction of Robert opens up a new field of potential for future sketches. Candace and Toni are unsettling enough when they’re in control of their own store, but the prospect of giving them family members opens up a whole new level of insanity. Something made them the way they are, and it’s also a safe bet that they’re something that made other people the way they are. 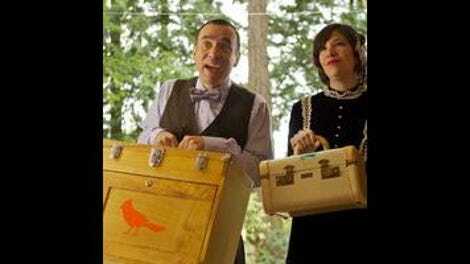 The focus on various incarnations of Armisen and Brownstein keeps the episode relatively grounded for a Portlandia installment, with guest stars contained to their own sketches. One of these focuses on a new food cart, Stu’s Stews, run by Stu and his friend Donald, played respectively by Matt Lucas and the always welcome Jim Gaffigan. They’ve yet to have any customers in six days, a move Donald credits to the cold. (“Maybe it’s like stew weather, and then it’s so cold, I don’t want stew, I just want a blanket.” Stu: “I think you can’t eat a blanket.”) Unsurprisingly for a comedian who’s built a career on food jokes, Gaffigan carries this sketch as Donald tries to drum up business, noting that it’s hard to build a customer base when your free tastes sound like “stool samples.” Of the new concepts introduced this episode, the food cart should slot nicely into the show’s universe, and hopefully it’ll serve as a setting in future sketches. There’s also a brief appearance by Jack White as a sort of silent Christmas spirit, at the end of the sketch about a recording studio constructed by a mustachioed Armisen who’s entirely too excited at the sound he gets and anxious about how much he spent. White’s cameo aside, this one drags out a little too long, Armisen’s increasing references to how much it has that Pet Sounds vibe running a little thin after a while, and the bit with the echo chamber only working a bit. The fact that he’s playing off a silent partner in Bobby Moynihan doesn’t help, as it starts to feel desperate—and not in an entertaining way. Again, it’s somewhat surprising that “Winter In Portlandia” doesn’t turn out to be a holiday special, but honestly Portlandia doesn’t seem like the type of show that would support one. The universe of Portlandia is by definition one that avoids serious emotional stakes, emphasis on tradition or hearts growing three sizes that day. These are people who would care about the holiday only in relationship to them, so it’s probably better Armisen and Brownstein avoided trying to force treacle into this world. As such, “Winter In Portlandia” manages to be a welcome reminder of just how entertaining the show's sense of humor remains, and when it returns full-time in January, I’ll be glad to have it back as another distraction from the long, grey days. The cold open ends with an entirely random bit of two pigeons on a wire, where one encourages them to fly south before a random man takes it away, and the second one poops. An odd moment that comes and goes so quickly you almost convince yourself you imagined it. Also, there’s a sketch involving nap time at the office complete with nanny, and a boss who eats himself into a food coma. Not funny or interesting enough to warrant any further discussion. With Peter’s downward spiral, there’s a sadly missed opportunity for Aaron Paul to have a cameo appearance as a noodle pusher. Candace’s drink of the moment: sort of an unsweetened maple syrup.